If you think only humans are able to ride a bike, think again. Because Norman is about to prove you wrong. Norman, the 5-year-old French sheep dog from Georgia, USA became an internet celebrity after a video of him riding a bike went VIRAL! According to his owner, "he started out riding a scooter, and then moved onto riding bikes... and he absolutely loves it. This dog eventually breaks Guinness World Record, his mom Karen Cobb said, Norman has recently mastered riding his special blue, personalized bike outside his home in South Carolina. Able to push each of his back legs down to start the pedaling motion, Norman took 10 weeks to learn to ride his bike, which is quicker than some children. 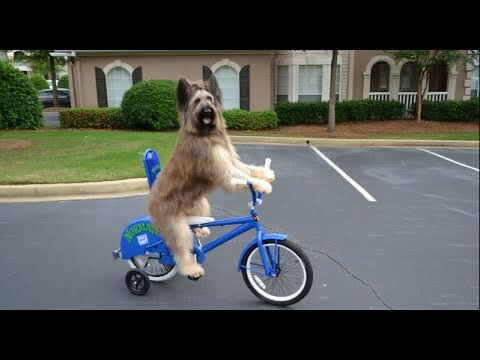 This loyal dog is able to mount the blue bike, with a little help from his mom, and once onboard, he is happy to show off his new skills to any of his astonished neighbors. Check out this amazing video and enjoy the rare talent display by this furry-pal! DoglopedixIf you think only humans are able to ride a bike, think again. Because Norman is about to prove you wrong. Norman, the 5-year-old French sheep dog from Georgia, USA became an internet celebrity after a video of him riding a bike went VIRAL! According to his owner, "he started out riding a scooter, and then moved onto riding bikes... and he absolutely loves it.